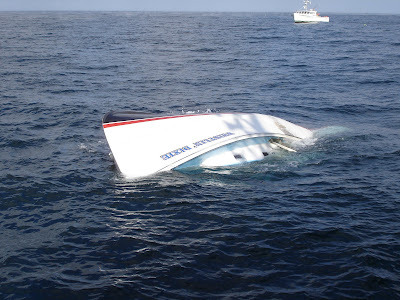 The captain of the Portland-based lobsterboat, Whistlin' Dixie, reported colliding with something in the water that drove the vessel's rudder up through the bottom of the boat. Flooding was too severe to control and the vessel soon filled with water, and by the looks of things, rolled and foundered. The captain and his mate acted quickly to deploy the liferaft and abandon the vessel. Both escaped serious injury. If you think about it, a boat's rudder arrangement is a potential weak link, particularly with modern lobsterboats built for speed and efficiency. If you have a narrow, streamlined skeg, you have a situation in which something hitting the bottom can deflect the skeg and rudder. Even a deflection of a few inches is enough to drive the rudder blade into the bottom of the receiver (bolt) in the rudder box. If it's a good, smart hit, and the rudder is stainless steel - as so many are these days - the force of the blow can dislodge the whole rudder box and drive the four through-bolt heads through the bottom of the boat. This might be what happend to the Whistlin' Dixie. A heavier, beefier skeg would help prevent this type of casualty, as would a smaller rudder blade. Then again, a boat with a heavier skeg and smaller rudder blade is going to be less efficient and less maneuverable. There's your trade-off. But what would you rather have? A boat designed to take the heavy punishment of the work you do, or a boat designed for speed, efficiency and a trophy at the races? Here is the MAYDAY call to Coast Guard from Whistlin' Dixie. UPDATE: I heard a report yesterday that the boat was towed to shore for repairs and an eventual return to service. Hamas Unveiled. In their own words. Although I have written about piracy and have often defined it as a form of terrorism, the fact is it doesn't matter whether we call them pirates, terrorists, extortionists, anarchists or gang-bangers. What's important is that we recognize them as a hostile and dangerous group that plans to do us grievous harm. They are our enemy, and we should treat them as such. Any attempt to explain, excuse, dilute or find meaning or rationalization in their message is intellectual folly and a deadly step in the wrong direction.